Engraving of Jonathan Mayhew, an outspoken Boston preacher who argued that civil and religious liberty for the American colonies was ordained by God. Courtesy of the Library of Congress. In the years preceding the Declaration of Independence on July 4, 1776, many American colonists expressed opposition to Great Britain's policies toward the colonies, but few thought seriously about establishing an independent nation until late in the imperial crisis. Throughout the years of controversy beginning in the 1760s, Americans expressed a variety of opinions about the legitimacy of open acts of resistance and rebellion, which intensified as armed resistance began in April 1775. On both sides of the issue, perspectives and motivations were diverse. Among those who favored resistance, for example, not all would go so far as to advocate full-scale rebellion against Great Britain or national independence for the United States. The debate, moreover, was not a static one, and its terms shifted over time; by 1776 many colonists found themselves advocating positions undreamed of a decade earlier. In this lesson, students are taught how to make informed analyses of primary documents illustrating the diversity of religious, political, social, and economic motives behind competing perspectives on questions of independence and rebellion. Making use of a variety of primary texts, the activities below help students to "hear" some of the colonial voices that, in the course of time and under the pressure of novel ideas and events, contributed to the American Revolution. Materials. Download and copy any handouts you plan to use in this lesson. For activity 1 below, you will need the PDF Voices of the Revolution: Document Analysis. If you plan to use Option #1—Point–Counterpoint Debate, below, provide students with a copy of the Point–Counterpoint Rubric, available here as a downloadable PDF. If you choose Option #2—Group Research and Class Discussion, provide your students with a copy of the Essay Rubric, also available as a downloadable PDF. Background. Before beginning the activities described in this lesson, you should provide your students with a general background on the differences that existed among the American colonists prior to the outbreak of war. Guided Readings on the American Revolution, including causes and motivations, are available from The Gilder-Lehrman Institute of American History, a link on the EDSITEment-reviewed History Matters. While you may wish to present the spectrum of colonial opinion in terms of arguments for and against rebelling, help your students to understand that the debate shifted over time, and that acts of resistance do not necessarily amount to calls for rebellion. A good way to introduce such nuances is within a chronological framework. You can find an excellent annotated timeline of events during the Revolutionary War era from the EDSITEment-reviewed American Memory collection. Another approach to providing an overview of the events and opinions leading up to the Revolutionary war is to present students with the evolving views of a single influential individual over time. For a central example, see the individual letters written by George Washington, available from the EDSITEment-reviewed The Papers of George Washington (in particular, look at the twelve letters in the The Road to Revolution 1765–1775 series). Once a speaker of the Pennsylvania Assembly and friend to Benjamin Franklin, Joseph Galloway was a loyalist who fled to England in 1778. 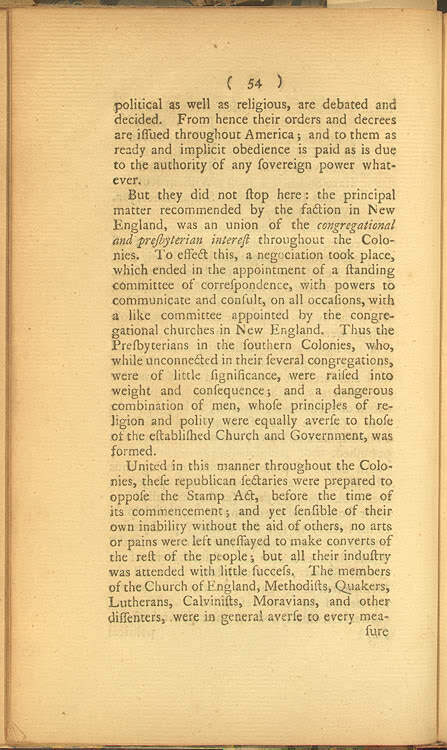 In this excerpt from his book, Historical and Political Reflections on the Rise and Progress of the American Rebellion, he asserts that the cause of the rebellion was essentially religious, a result of the animosity of Congregational and Presbyterian interests in America towards the Anglican Church (for more, see Religion and the Founding of the American Republic). 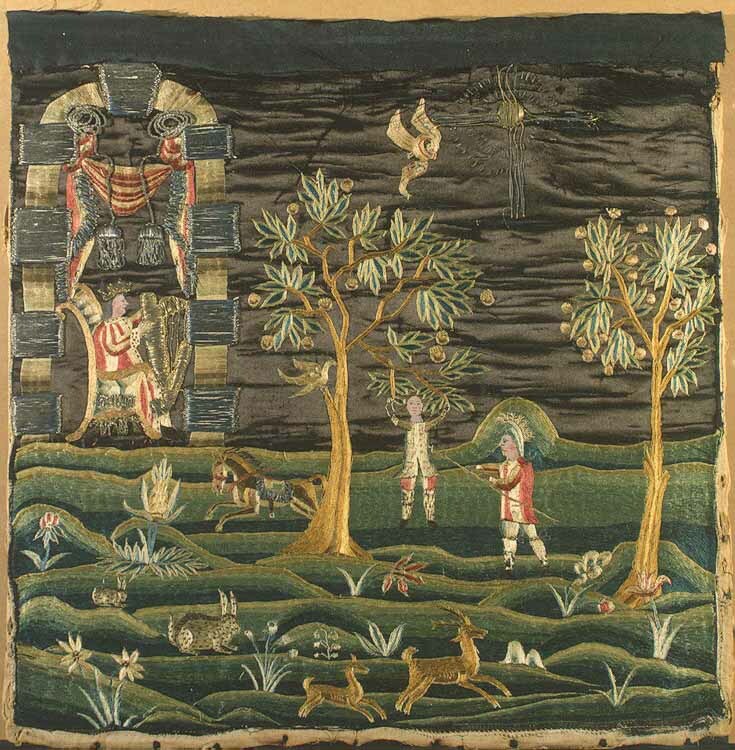 An allegory done in needlework, "The Hanging of Absalom," illustrates the tendency of American colonists to view the conflict with Britain in biblical terms. The following interpretation of this allegory is provided: "The creator of the work saw Absalom as a patriot, rebelling against and suffering from the arbitrary rule of his father King David (symbolizing George III) …" (for more, see Religion and the Founding of the American Republic). Other possibilities from Religion and the Founding of the American Republic include a sermon arguing that rebellion is justified by God, a revolutionary battle flag containing religious symbolism, arguments among Quakers about whether to join the battle, and documents that illustrate divided loyalties within the Anglican Church in America. Plain Truth, a response written by loyalist James Chalmers to Thomas Paine's Common Sense (the text of Chalmer's response comes from Archiving Early America, a link on the EDSITEment-reviewed Internet Public Library). Charles Inglis, an Anglican clergyman and loyalist, responded to Thomas Paine with an anonymous pamphlet, "The True Interest of America Impartially Stated," which argues for a reconciliation between Britain and the American Colonies (the text comes from Revolution to Reconstruction, a link on the EDSITEment resource Internet Public Library). Available from the Avalon Project at the Yale Law School, the famous speech by Patrick Henry in which he proclaimed, "Give me Liberty or Give Me Death." Another example, from The Papers of George Washington, is George Washington's letter of May 31, 1775 to a close friend in which he suggests his resolve to rebel: "But can a virtuous man hesitate in his choice?" African American petition in 1773 to Governor Hutchinson, written by Felix on behalf of "many Slaves, living in the Town of Boston, and other Towns in the Province." "Free Black Patriots," an essay on free black men from the North who fought on the American side. "Runaways," an essay about black slaves who fought on either the British or American side during the Revolution in order to escape slavery. In "Of the Natural Rights of Colonists," Bostonian James Otis wrote that "the colonists are by the law of nature freeborn, as indeed all men are, white or black," making him one of only a few American writers of the time who combined an argument for succession with an argument against slavery. From the Avalon Project at the Yale Law School, two documents written on the eve of the Declaration of Independence: George Mason's Virginia Declaration of Rights (June 12, 1776), and Richard Henry Lee's Resolution, which proposed to the Continental Congress a declaration of independence (June 7, 1776). Also, available on From Revolution to Reconstruction (a link from the Internet Public Library) is Declaration of the Causes and Necessity of taking up Arms (July 6, 1775). The text of the Declaration of Independence, as well as a wealth of supporting resources, from the Digital Classroom (National Archives and Records Administration). What is the general motivation of the writer of this document (i.e., religious, philosophical)? Were there any antecedent events directly preceding the authoring of the document that may have influenced it (i.e., the Stamp Act, Boston Massacre)? Are there any significant attitudes about rights of various groups expressed? Explain. Was this a document originally intended for a small audience or large audience? Would the type of original audience affect how the document was authored? Is there a specific call to action in the document? If so, what? Is there a claim of authority or credibility made by the author of the document (i.e., moral, common sense)? In addition to these questions, you can also download a Written Document Analysis Worksheet from the Digital Classroom, a resource from the National Archives and Records Administration. To model the process of analyzing primary documents, you may wish to provide the class with copies of the letter of George Washington to George Mason in 1769. Although a little long, it provides a strong document of which to ask all of the preceding questions. Its readability is also aided by annotation provided following the document. The letter provides natural interest since it was written by the future commander of the armed forces and first president of the United States. Option #1—Point–Counterpoint Debate: Assign students to individual historical persons or viewpoints based upon particular primary documents. After students have had time to examine their assigned documents and to fill out a Document Analysis Worksheet, they are ready to prepare for an in-class debate. Use the Rubric for Point–Counterpoint Debate, available here as a downloadable PDF document, to present students with instructions for preparing for the classroom debate. Direct students to the Internet resources described in Preparing to Teach to research the additional information they will need to clarify their position in the debate. As outlined in the Rubric, students then do a "point counterpoint" debate during class time. Option #2—Group Research and Class Discussion: Students are put into groups where they will form an answer to the following question: "Before 1779, the reasons for an individual's support for or opposition to independence were primarily economic." Assess the validity of this statement. Each of 4–5 student groups will be given a cluster of primary documents (see examples in Preparing to Teach) that supports a viewpoint being driven by a certain reason (i.e., religious, economic, philosophical). Each group must frame their answer based upon the documents that they are given. There will be an overall class discussion with opportunities for each group to present their views. Assign students an essay based on their work for one of the two options described above. Student essays should develop a focused thesis statement supported by the evidence from both primary and secondary sources. Specific instructions for the essay, as well as an assessment tool, can be developed from the downloadable PDF, Rubric for Student Essay. "Of the Natural Rights of Colonists"
Patrick Henry speech "Give me Liberty or Give Me Death"
"George Washington letter to George Mason on April 5, 1769"
"George Washington letter George William Fairfax May 31, 1775"
Jonathan Mayhew, "Discourse Concerning Unlimited Submission and Non-Resistance to Higher Powers"
Joseph Galloway, "Historical and Political Reflections on the Rise and Progress of the American Rebellion"
Critique varying reasons for why individuals chose to rebel or remain loyal. Analyze various documents that are rebellious or loyalist in nature. In the years leading up to the American Revolution, what were some of the attitudes expressed towards rebellion and what were the motives and allegiances behind these diverse viewpoints?